. : Matthias Purdon :: Ski XCOttawa.ca :: Skiing in Ottawa and Gatineau Park :. 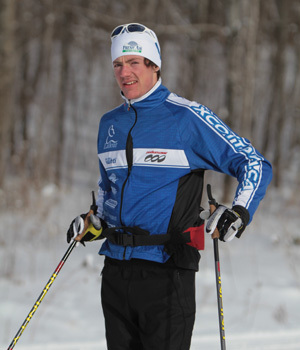 Matthias is originally from Owen Sound, Ontario and got his ski racing start with Georgian Bay Nordic. This will be his fourth year on XC Ottawa. Matthias has completed his degree in environmental studies at Carleton University. This suits him well as he bikes everywhere and he has been known to scoff at friends who drive places reachable by bike. Matthias is also an excellent sailor and has his coaching certification in sailing. He enjoys surfing, photography and chilling playing his guitar. Last year, Matthias had a break through National Championships which finished with a 15th place in the 50km skate race. His long term goals are to win the 49km Gatineau Loppet, keep up his love of the sport and ski and surf in the same day. Other notable past ski achievements include finishing 2nd in the 50km classic Gatineau Loppet, winning the 29km Gatineau Loppet in 2008 and placing 15th in the Junior Men's classic sprints at the 2008 National Championships.